In a saucepan over medium-high heat, combine vegetable stock, soy sauce, mirin, and honey. Boil until volume is reduced by half, approx. 10 – 15 min. Preheat oven to 180°C (350°F). 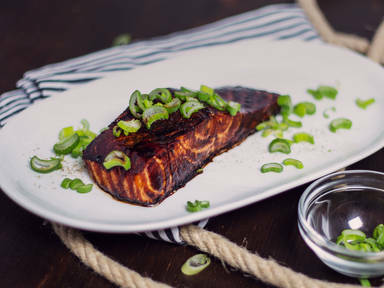 Place salmon in an ovenproof pan. Brush on teriyaki sauce so that all sides are coated evenly. Bake salmon in preheated oven at 180°C (350°F), approx. 10 – 12 min. Remove from oven and transfer to plate. To serve, garnish with green onion and season with pepper.